The amount of information that is flying around the Internet is incalculable. Tumblr has grown from averaging 27,000 daily (blog) posts just two years ago to over 75.5 million daily blog posts. More and more reputable voices in varying industries are stepping up to the plate of content creation and it has grown increasingly difficult to sort, organize and read the ever-growing archives. It is particularly difficult in a field like mine. Like most fields, digital marketing and website creation is ever-evolving. Social Media channels seem to change timeline layouts and image sizes almost weekly and Google appears to take joy in having marketers constantly guessing at their complex and allusive search algorithm(s). Not only is the amount of content available online growing at such a fast rate, but the ways in which I receive content makes me feel like I’m being attacked from all angles. I sift through helpful articles alongside corny memes and viral videos on my Facebook timeline. I juggle valuable links that friends and coworkers send to my email inboxes, whether personal or work. I work seamlessly between my mobile phone and my desktop computer (I can’t imagine if I also had a tablet). I’m sitting down and putting together this article because I have finally found something that can help me sort through this mess. Meet Pocket (formerly Read It Later). You can easily collect almost anything and it compiles it into a nice list for reading that’s accessible from anywhere. I’ve only used it for collecting articles but you can use it for collecting almost anything. The interface is very clean too and optimized for any device. So you can read on anything from your mobile phone to your computer with ease and it all has the same clean, easy to read interface. That sounds like Evernote, Readability or Instapaper — How’s it different? Evernote does lay trump when it comes to taking notes. The ability to search your accumulated notes simply cannot be matched by Pocket. And for a very good reason — because Pocket was not made for that purpose. If you need a note taking app, Evernote is what we would recommend but that is a whole different discussion. Readability does many of the same actions as Pocket but I get the vibe that it is still playing in the minor leagues in comparison to how progressive Pocket works and feels. For example, the amount of supported apps and software integrations offered by Pocket is incredibly impressive. When you’re looking for something that works with and for you everywhere you are at online, you want an app that plays well with others. Instapaper has attempted to turn the quickly growing work of content writing into a social network of sorts, in which you can follow your friends and discover new content. For my needs, which is sorting new content and certainly not discovering new content, the unique abilities that Instapaper offers would only further my distracted attempts at getting through content (which may be why The Verge wrote “Don’t call it a reading app: Instapaper grows up”). If you are looking for a network to discover and follow new content, Reddit or Instapaper may be what you’re looking for. 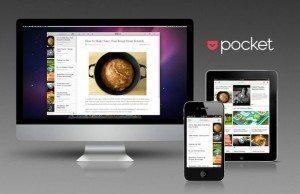 Pocket has two main tasks: (1) store those “must read” articles or links for you and (2) provide you with a distraction free place to read those articles at your convenience. That’s it. For me, Pocket is perfect for collecting articles for reading and it just has nice little enhancements that make it really easy to use. For example, I always see stuff in Facebook that I’d like to read. But Facebook likes to keep things on Facebook so there’s no easy way to save things for later. With Pocket, all you need to do is copy the link to the article that’s posted on Facebook, open Pocket and it knows that you have a link on your clipboard and it asks you if you’d like to add it to your reading list with one click. Done. 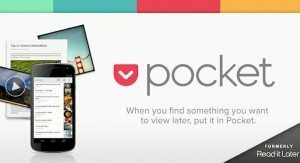 LifeHacker does a great job of comparing Pocket to a few popular alternatives (read their article now or store it in Pocket to read later), but Pocket has got our vote for managing the content chaos!